Henry has been really into pirates lately. I am not sure if it started with Captain Jack Sparrow in his Disney Infinity set, but it has grown exponentially since discovering him. He now requests people call him Jack instead of Henry. He made this request to his teacher, but Ms Gladys politely declined and continues to call him Henry. Still, when I picked him up from school the other day she said "Bye Henry!" and all the little kids yelled 'BYE JACK!!!" So... yeah. "Um... yeah. 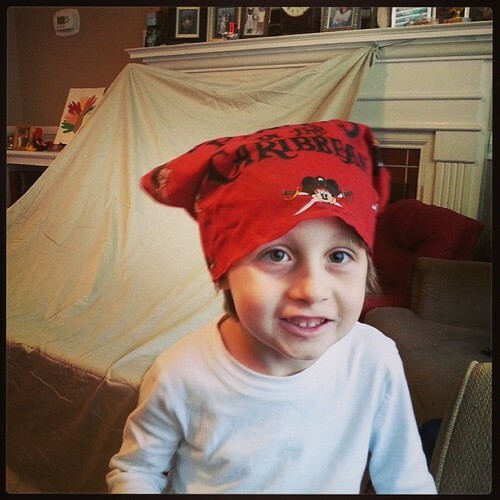 But also a real pirate ship." Oh. So, like, when you said "BIG" you meant 'sail on the ocean' big, not 'takes two hands to carry' big. I told him the only thing I could. "Oh sweetie, a real ship wont fit in Santa's bag"